Every time I attempt to log in lately i get the attached message. I then have to click to re-send verification, wait for the email and then click on the hyperlink in the email to get into the forum... this has been going on for a week now. No computer changes, nothing else strange at my end. What gives? Can you help? If it makes you feel any better, while I have able to log into my account just fine I got the same message while trying to log int to the admin console to see if there was anything I could do about this. I suspect the issue may be more prevalent than just you, I'll pass this up and see what can be resolved. Photobucket is trash now, use something else. Well, it doesn't REALLY make me feel better but at least I know that you're pushing it up the ladder and the more ppl that complain the more attention it will get. Thanks! I had the same error when logging into the admin account, once I did what it asked it never came back. I think it is to do with the security of the forum, changing IP addresses seem to be flagged, which is of course very annoying. I would be interested in the outcome of this, just to see if there is something amiss or if something can be done to correct it. Where are you logging in from? Home or work? 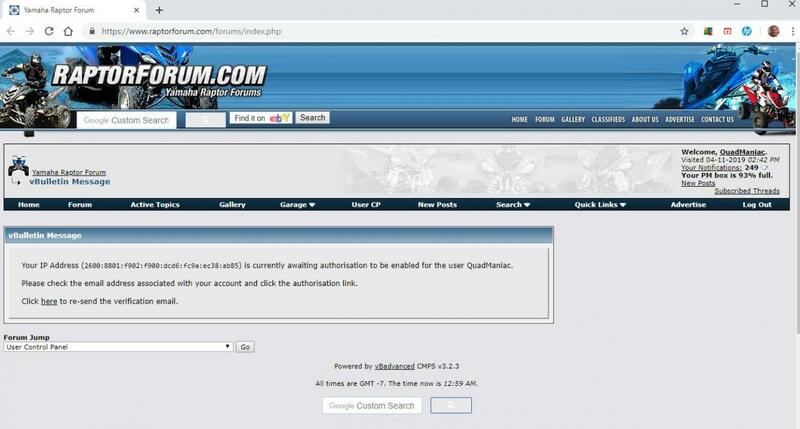 That looks like a private IP, or an IPv6 and the forum cant seem to handle it. When you get that message and hit the refresh button, does it change at all? Nice find, I never noticed that..